The Barrington Atlas of the Greek and Roman World was published in 2000 as part of an international effort to create a comprehensive map and a directory of all ancient places mentioned in sources and a selection of important archaeological sites. Since then two digitization efforts based on the Barrington Atlas have come into being, Pleiades, which started off as a historical gazetteer,and the DARMC project, which is a layered historical atlas. In 2010-2011, as part of a common project, the geodata of DARMC was transferred to Pleiades, though, unfortunately, not all the places in the original Barrington directory could be matched between DARMC and Pleiades, resulting in many places without precise coordinates and feature data. Nonetheless, ever since, the Pleiades gazetteer has had the ability to display most ancient places on a map, individually and with their immediate surroundings, using Google Maps API and Google Maps as background layer. In March 2012 the Ancient World Mapping Center launched a first version of an online GIS application called Antiquity À-la-carte, covering the entire Greco-Roman World. This application is also based on the Barrington Atlas, on geodata from Pleiades/DARMC, and its own digitization efforts (roads, aqueducts, ancient coastlines). Yet, while the DARMC and Antiquity à la carte initiatives provide geographical coverage and exiting possibilites to compose custom maps in layers, until now there has been no digital map that can be used as background layer for use in a fashion similar to modern mapping applications like Google Maps. Thanks to Pelagios, this is work that I have undertaken, with a view to aiding any archaeological or historical research interested in or using online mapping. We are releasing the map with a CC-BY license, allowing anyone not only to browse and consult it but also to use it for representing their own data or to build on it their own applications, provided that they include a proper scholarly attribution. What is more, the map can be used with OpenLayers, Google and Bing maps, so that anybody, who already has these systems in place, can easily swap out the map tiles for these historical ones. To see the basic background map (using Google Maps API), click here (default setting is Rome, zoom level 7 of 11). For information about the making of the map, sources of geodata, and a legend to the symbols, click here. For those of you interested in finding out about how the map came into being, keep reading! The aim of my work with Pelagios has been to create a static (non-layered) map of the ancient places in the Pleiades dataset with the capacity to serve as a background layer to online mapping applications of the Ancient World. Because it is based on ancient settlements and uses ancient placenames, our map presents a visualisation more tailored to archaeological and historical research, for which modern mapping interfaces, such as Google Maps, are hardly appropriate; it even includes non-settlement data such as the Roman roads network, some aqueducts and defence walls (limes, city walls). Thus, for example, the tiles can be used as a background layer to display the occurrence of find-spots, archaeological sites, etc., thereby creating new opportunities to put data of these kinds in their historical context. 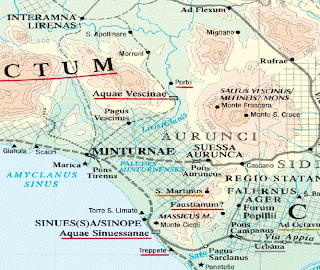 Rome and Central Latium at zoom 9, click to display the full image. In a departure from the original Barrington Atlas and the Pleiades dataset, our digital map does not try to implement time periods when places are attested, nor does it speculate on the certainty (or otherwise) of locations: only precise locations from the Pleiades dataset can be rendered on the map. Nevertheless, since many places lacked precise coordinates and/or feature data, a good deal of effort has been made to improve the data. For sake of clarity, we have displayed only one of an ancient place’s possible names, based on its primacy and importance in the Barrington Atlas. The digital map is presented at eight different zoom levels (3-10: zoom 10 corresponding to a scale at approx. 1:500,000), and one additional zoom level (zoom 11, which corresponds to a scale at 1:300,000) for maps of Central and Southern Italy, Northern Tunisia, Greece, Turkey, Syria, Lebanon, Israel, Palestine, Egypt and Jordan. Due to the lack of precise coordinates in the original dataset for regions, cultural (tribes, people) and natural features (mountains). thus far only places have a complete rendering on the map, while major rivers and lakes have been labelled with Latin names. These considerations have been made to keep the map simple and easy to understand, which is a necessity for online publications, especially for interactive maps that users may want to click on, pan and zoom. The transmission of the tiles to any web-mapping application is permitted under a Creative-Commons 3.0 (CC BY-SA) licence. 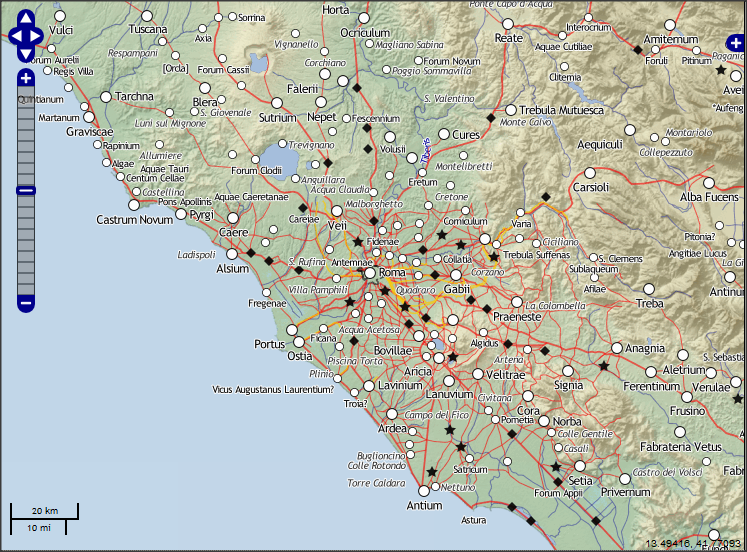 Attribution to the Digital Atlas of the Roman Empire (DARE) project at http://dare.ht.lu.se is required and linking to this blogpost is encouraged. See below for implementation instructions. There is a short description how the map was made at a separate page. Here you will also find the legend of the map and a listing of datasources for the geodata of the map. The map can be viewed in fullscreen mode at this page. The Barrington Atlas used maps at three different scales. The central Mediterranean provinces of the Empire were rendered at 1:500,000, which corresponds to zoom level 10 on the digital map (which is 1:545,979 to be exact), peripheral provinces like Britannia, Germania, Belgica and Gallia were rendered at 1:1,000,000 (zoom level 9). There were also special maps of Rome, Carthage, Athens, Constantinople and their surroundings at 1:150,000 scale (zoom level 12). The accuracy of georeferencing the 1:1,000,000 scale Barrington maps, given that the places are located correctly on the printed map, is around 3 kilometers, which is illustrated in the online example 1, where georeferencing using different sources of information is described. 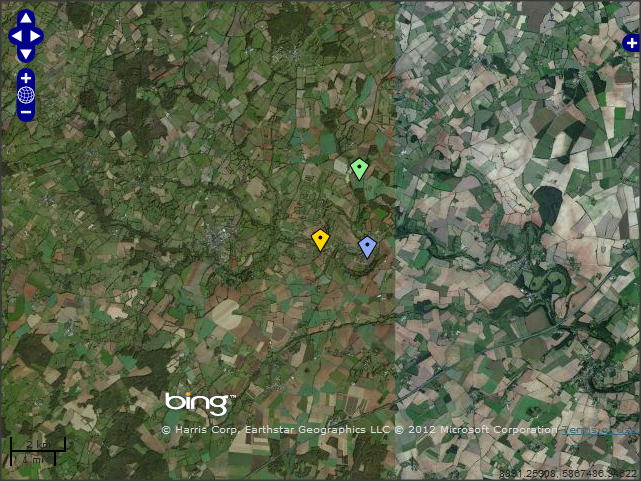 Example 1: Georeferencing the sanctuary Sanxay, dep. Vienne, France using different sources. Over the past few years, the conditions for successful georeferencing of ancient places has increased. Nowadays there is better satellite imagery; national mapping agencies offer APIs to quality maps (e.g. Géoportail, IGN, France and OpenSpace, Ordnance Survey, Great Britain); georeferencing services have better accuracy, with the result that e.g. Google Maps Geocoding Service can return places that aren’t even visible on their own maps (e.g. small hamlets); main archaeological monuments throughout Europe and the Middle East have their own articles on Wikipedia, often with highly accurate coordinates; national heritage agencies offer online database services, etc. From the beginning it was clear to me that, since we were creating a map, we would require information that was not included in the original Pleiades dataset, and also that it was necessary to render ancient and modern placenames in a different way. One such example was the relative importance of a place. In the Barrington Atlas, places were represented in a hierarchy of importance through the use of font and its size, so that, for instance, those places considered of greatest significance – capitals, settlements with the legal status of colonia and municipia, legionary bases, important sanctuaries and mines – were rendered using capital letters. On our map, we let those places appear first, so that users can immediately locate themselves in the landscape and grasp at a glance those places which have greatest prominence in our sources. The Barrington Atlas and the use of font and font-size to indicate relative importance among places. 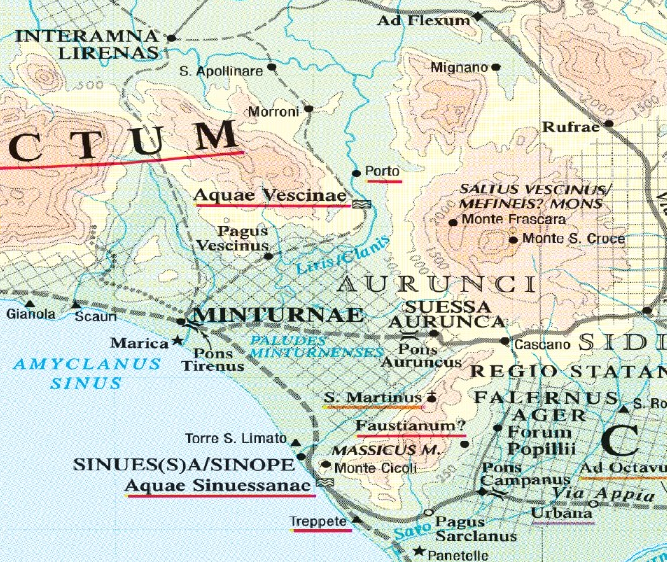 Minturnae (Minturno, Italy) is the most important place on this map, allthough all placenames with capital letters (Sinuessa, Suessa Aurunca and Interamna Lirenas) are assigned to the category of major settlements on the digital map. After careful and repeated study of the Barrington Atlas, I found a total of 1488 places indicated as important on the map by its font and size (capital letters), mainly settlements, but also legionary fortresses, rural sanctuaries (in fact there are three of them, all Greek: Olympia, Nemea and Isthmia), to a residence, the villa of emperor Hadrianus, near Tivoli (outside Rome). In our dataset, these places have been assigned a major/important property allowing them to appear on the map before other places (i.e. at lower zoom levels) and depicted with bigger symbols and font. Even given the time restriction of the project, we decided that it was important to get the features and coordinates of these places as accurate as possible. Some belonged to those cases where Pleiades and DARMC had trouble aligning their datasets, especially those places sharing the same ancient name. For instance, only one of the two important places in Britain names Isca had precise coordinates in the Pleiades dataset (that named Isca = Caerleon, Exeter), and only one of three of the cities (that named Venta = Caerwent, Winchester, Caistor-by-Norwich). There are several ways to get your data on the map, though it is beyond the scope of this article to go into the detail. The simplest way is just to place a marker at a specific location on the map: with its political and cultural infrastructure, our presents offers a favourable comparison to modern streetmaps in the display of information. Another popular way is to load a Keyhole Markup Language (KML) file into your webmapping application. This is demonstrated in example 4 (OpenLayers) and example 5 (Google Maps), where a KML-file containing the Roman milestones in Western Continental Europe is loaded. by entering a search expression of an ancient or modern name or part of a name. Results of your query appear in the right sidepane. 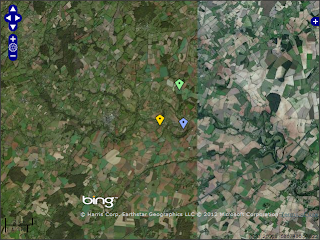 It is also possible to display a detailed view of the site using Bing Satellite Maps or OpenStreetmap. For the future I envisage more places being included in the database: a digital map has no restriction in space, whereas the Barrington Atlas was constrained by the physical size of its pages (which even then were big, as any owner of the Barrington knows!). In this version I have stopped at zoom 11: however the freely usable OpenStreetMap continues to zoom 18 and already contains highly accurate data about the structure and shape of many archaeological sites. In addition, the OpenCycleMap, among others, has shown that elevation data from the SRTM dataset can be rendered at zoom level 14 with some interpolation. Finally, national agencies (e.g. IGN, France) are continuing to release land-use data that are being incorporated in the OSM dataset. Therefore I see a growing archaeological map of the Ancient World, not only a historical map. Meanwhile the author is looking forward to hearing about your experience of this map, so that together we can improve our understanding of ancient world geography using twenty-first century technologies. This work has been supported by the Pelagios project, and I would like to thank Leif Isaksen, Elton Barker and Sean Gillies (Pleiades), who provided ideas, support and feedback. Jeffrey Becker at the Ancient World Mapping Centers has brought to my attention that the Antiquity à la carte application covers the entire Greco-Roman World, not just Greece, Turkey and Central Italy as I wrote in the background section. I have change that sentense to reflect the real coverage of the application. I am very excited to see the result, hope you like it too. Now lets work towards the improvement of the data so that we can add more and more zoomlevels! Congratulations for a very significant contribution to the study of the ancient world. I am glad to see that you have adopted an open license for the map tiles. I should however warn you that if any data you are using to generate the map are from OpenStreetMap, it would be much better to check whether CC-BY-SA should be used instead (or ODbL with the recent license change). It would be interesting to combine these tiles with the data I am gathering at http://vici.org/ . I hope to find some time soon to play with it. Hi René – I think the two go together extremely well. In fact, I wonder whether whether together they might help 'self-correct'. I'm not sure where our road data comes from, but there are times when the two data sets appear to diverge a little bit and it would be great to refine our data in such instances. Do you or Johan have thoughts about how we might do this? Currently, coastline data and the city walls of Rome and Istanbul are from the OpenStreetMap dataset. Since coastlines are below the topographic layers (based on SRTM) it does not display. For the future, with higher zoom levels, an increased use of OSM data is likely to be included, for instance, landuse data and shape of archaeological sites. Leif, do you have any thoghts regarding license? Not really, other than we need to stick by whatever their licensing terms are I have no objection to releasing the data under ODbL. It would be great to use, as coastline (and hydrography), not the current one, but the real one during Roman Empire. Any change to use already existing data about that? Ancient coastline from the Barrington Atlas has been digitized by the Antiquity à la carte project. This layer (CC BY-SA 3.0) will be included in upcoming version of the Digital map of the Roman empire. In the meanwhile have a look at http://awmc.unc.edu/wordpress/map-files/. Please excuse a layman question, but why is Athens absent on the map? Are the shapefiles that you used for this map available anywhere? Is the data under some kind of Creative Commons license? I looked in the data tab but didn't see any shapefiles. I would love to take the data and use in to create a map in http://www.mangomap.com as it offers some cool search features and interaction tools that would be fun to test out with this data. It would be great to have, as coastline (and hydrography), not the current one but the real one during Roman Empire. Any chance to use existing data about that? This is a fantastic effort. Making this available for use in modern GIS (e.g. GRASS/qGIS) where you can deal with a huge range of data with spatial (X,Y,Z), direction (vectors w/ direction, origin, and magnitude–whether speed, number of plague infected ship passengers, or size of an army) over time, and temporal-spatial aspects. Need to make sure that the maps reflect what is going on at a given time. Computers are fine w/ fuzzy data, so exact locations are not really needed if you implement fuzzy logic (e.g. in place of X,Y,Z,time, direction, magnitude you simply substitute a probability function of some sort, either a range, confidence intervals, point estimate with standard deviation, whatever the computer can calculate). Just let the user/algorithm put in their preferred assumptions and see what the range of possibilities look like! Besides putting this into a heavy duty GIS framework, there are some great, easy to use applications which could make the whole problem of maps in history education (which most schools horribly mangle–if you don't wish for a series of feature movies w/ major Hollywood stars–e.g. Russel Crowe as Merriweather Lewis after covering Thomas Jefferson's administration you were screwed out of hell of an adventure and testimony to the resourcefulness, grit, and devotion of the human spirit) a lot more enjoyable for students from K-12 to post-doc fellows. Take a look at KDE Marble for an application platform to publish your work. Historic maps right now are limited to wrapping things like wrapping the map smuggled by Alberto Cantino in 1502 onto a sphere. The platform is much more robust–can do OSM, Google or Microsoft satellite maps, and hybrids (e.g. MapQuest + OSM + NASA/JPL-Caltech-USDA road maps), and even routing. It would be really cool if you could include navigation routes (rivers, oceanic routes known/possible at a given time) and see what sort of routing options you might have in 128 BCE v. 240 CE between two cities. Is there a way to extract this map as a high quality jpeg? I'm a French teacher, and I would love to be able to create a poster of Gaul with these roads and the French cities that still exist today (Paris, Bordeaux, Marseille, etc.). According to the latest research on the battle of Tegyra, the locations of Tegyra and Aspledon on this map are reversed. See Pritchett, Fossey, and Buckler's discussion on the location based on Plutarch's description. Hello and thank you for this amazing website! I am currently working on my graduation project on via Flaminia, attempting to revitalise its importance as a travellers road. I am experiencing some difficulties building a topographic model of its entire length (310 km in total from Rome to Rimini) and I was wondering if you could give some advice on how to do it faster. I see that in your website there are all the topographic lines (every 100 m). Please reply to this comment or give me your email address if you wish and I shall contact you there. Thank you very much in advance and keep up with the good work!